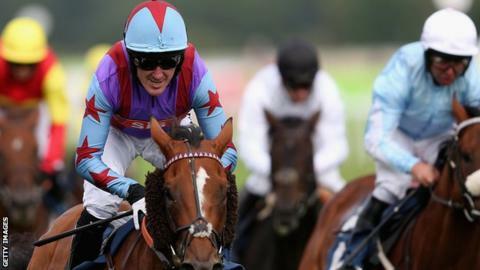 Record-breaking jump jockey AP McCoy came out of retirement for one race - and rode the winner of the Leger Legends charity contest at Doncaster. The 20-time champion, on 7-2 favourite Gannicus trained by Brendan Powell, saw off the Billy Newnes-ridden Next Stop (16-1) to triumph by two lengths. McCoy, 41, who retired in April, vowed this would be his last race. "This was very enjoyable, but a one-off," said McCoy, who was riding to raise money for injured jockeys. Jockey-turned-broadcaster Luke Harvey was third on Big Storm Coming (20-1), with Gay Kelleway fourth on Swordbearer (9-1), in the one-mile flat race. McCoy, who rode more than 4,300 winners in his career, was third in both races during his final competitive outing at Sandown in April. Punters crowded around McCoy before the race for autographs and pictures, and he passed the winning post to resounding cheers. McCoy said he was persuaded to ride because the race is a fundraiser for the Injured Jockeys' Fund. "This is for a great cause. My riding days are over and it's nice to go out on a winner," he said. Powell added: "Me and AP go back a long way so it's nice. That gave me a real thrill and for that to be AP's last ride it is brilliant." BBC horse racing correspondent Cornelius Lysaght: "Despite the four months since he quit the saddle, the gate at Doncaster was swelled by 9% compared to 2014, mainly down to McCoy's presence, say officials, and there was a feel-good factor. "Afterwards he kept repeating that participation in the Legends race, which helped raise £120,000 for the Injured Jockeys Fund, was 'for once and once only'. "So that is it then? We'll see, but if so, following two thirds on his Sandown 'retirement day', he's gone out on a winner. Very McCoy."